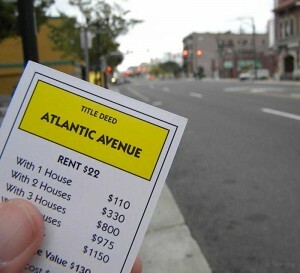 Question: Can a Monopoly board be used as a guidebook? Why yes! In Atlantic City, it can. Parker Brothers first published Monopoly 75 years ago this year — it began in various forms decades before as ‘Landlord’s Game.’ Some people don’t realize that the color-coded properties encircling continuous layout (i.e. Connecticut Avenue, St James Place, Marvin Gardens, Park Place) — are based on real ones in New Jersey’s famed seaside beach destination. And with the exception of one — St Charles Place — all can be visited, and doing so (sometimes) leads to Atlantic City’s best survivors from past-gone eras. I followed the board around Atlantic City recently. Several locals independently advised that the Baltimore Grill on Atlantic Avenue served ‘the best pizza in the world.’ It didn’t — and didn’t have a grill either — but I loved the ’50s-era throwback. Meanwhile, at the corner of Vermont Ave & Pacific Ave, I peppered the keys of an antique pianola in a 19th-century lighthouse, now surrounded by housing blocks. But the best stop? Easily St James Place, home to a classic pub and hotel at the Inn at the Irish Pub. Most memorable stay in an American hotel I’ve had. Like walking into a Little Rascals set, with picks from local estate sales that date to the Depression era, lacy curtains blowing in A/C-free rooms, slanted floors and — in my room at least — an embroidered Norwegian scene hanging opposite an inspirational quote taped onto a paddle. Tagged Atlantic City, Blogsherpa, board game, fun, game, history, humor, Mid-Atlantic, Monopoly, New Jersey, origin, Robert Reid, tour, USA. Bookmark the permalink. What about the four railroads? I loved this! Very original topic (and wish I had thought of it myself). 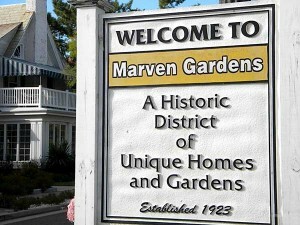 So MarvEn Gardens, huh? Had no idea! Sadly the railroads don’t exist — they tore down the original railroad station a few years ago. Also B&O never made it here. Short Line ran along the coast — cute.